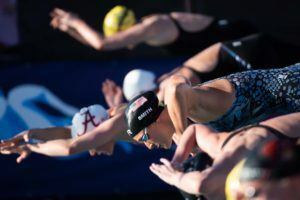 Melanie Margalis scored 9 Pro Swim Series points in Santa Clara to overtake the absent Taylor Ruck for the series points lead on the women’s side. 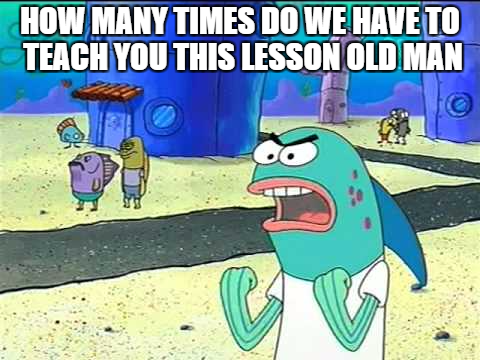 But Katie Ledecky scored another 15 points and is now only a couple wins out of stealing the lead. Lenny Krayzelburg’s SwimSquad won a tough Santa Clara meet, putting up the second-highest point total of any team at any meet so far. Krayzelburg’s 98 points is second only to the 107 his crew put up in Austin. Below are five interesting stories/predictions/expectations for this weekend’s meet. Note that these storylines are not meant to be exhaustive– there are plenty of great races and stories to follow this week; these are just a few of the most compelling. Nathan Adrian has never lost a 100 free at a Pro Swim Series meet since it was even called that. Yeah. But will it last? Caeleb Dressel is the name everyone jumps to immediately. 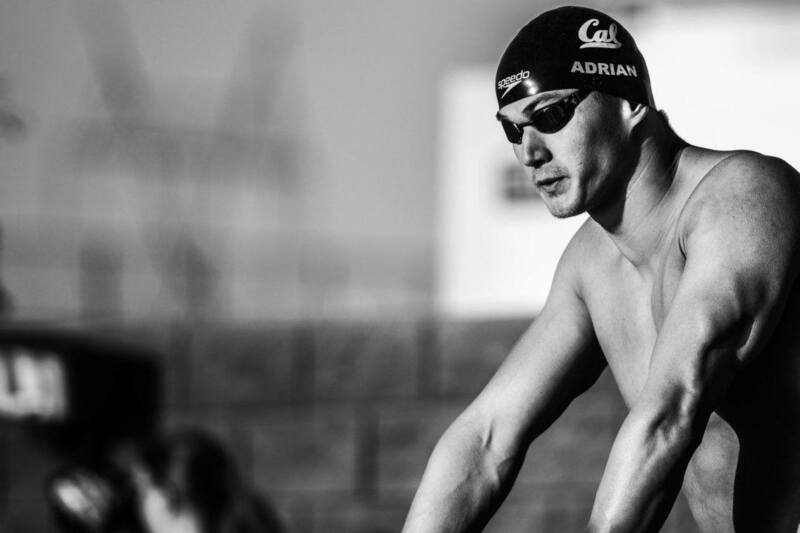 While he’ll be racing, he’s only been 49.5 this year, and he’s not known for throwing down huge swims in-season– meanwhile, Adrian is absolutely known for cruise-controlling 48’s whenever he feels like it. We can never count out Dressel, though. Additionally, Brazilian Marcelo Chierighini is entered in the 100 free. 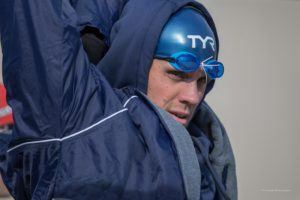 Recall that he swam a blistering 46.85 split in the 4×100 free relay at the 2017 World Championships. He’s been 48-point three times this year, though they were at the Maria Lenk Trophy, where he was likely rested. It’s not looking like Adrian will have too much to worry about, but with guys like Dressel and Chierighini in the meet, you can never be so sure. Regan Smith has been on the radar for awhile now, which is impressive considering she’s just 16 years old. However, the versatile rising star is not the only Minnesota native who continues to track high improvement curves. 15-year-old Isabelle Stadden, also from the Twin City area, is making a name for herself, too. She has danced with the 1:00 barrier in the 100m back all spring, and at the Mel Zajac Jr. meet, she clocked a lifetime best 2:08.37 in the 200 back to raise some eyebrows. Smith will race the 100 and 200 back, among other events, while Stadden’s lineup includes all three backstroke races. It wasn’t more than three weeks ago that Katie Ledecky smashed her own 1500 free world record at the Indy stop of the PSS, effectively hushing growing concerns about her stagnating as an athlete. She won’t be racing that event this week, sticking with the 100/200/400/800 free. She also won’t swim either IM race, two events she’s competed in relatively often of late. Ledecky didn’t go best times in any of her other free races in Indy, but she was still very fast for in-season. Without the grueling 400 IM and 1500 free, she may find enough strength to challenge some of her bests in other events. Fear those from the North. World record holder Kylie Masse is set to race on American soil, along with a couple other high-profile Canadian athletes. Masse, who holds the LCM world record in the 100 backstroke after an electric gold-winning performance at the 2017 World Championships last summer, will race all three backstrokes in Santa Clara. A fierce competitor, Masse has the world’s #1 times in the 100 back (58.54) and 200 back (2:05.98) this season, and the largely-American field (Olivia Smoliga, Smith, and Stadden, included) in California will be eager to try to track her down. Meanwhile, Olympic gold medalist Penny Oleksiak continues her tour with the Gator Swim Club, entered in the 50/100/200 free and fly. The 200 fly is a newer race for her, but she’s already shown promise in it, including a big 2:09.96 PR from last weekend’s Mel Zajac Jr. meet. Oleksiak will also get to race Simone Manuel in the 100 free — the two tied for Olympic gold in that very same event in 2016. Soon-to-be NCAA athletes Mabel Zavaros (committed to Florida) and Maggie Macneil (committed to Michigan) join Oleksiak and Masse from Canada, along with current NCAA athletes Olivia Anderson and Javier Acevedo (UGA) and IU alumna Kennedy Goss. It’s never a sure thing that great yards swimmers will be able to translate that prowess into the big pool. 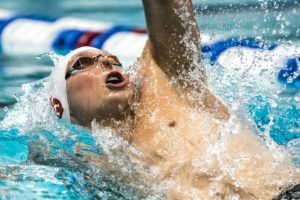 This past NCAA season, Stanford’s Ella Eastin, Wisconsin’s Beata Nelson, and Cal’s Andrew Seliskar all had breakthrough years. Now, they’ll look to lay the groundwork for improvements in long course. 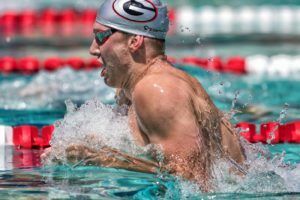 Eastin, of course, had a triumphant return after a crushing DQ at Nationals last summer, absolutely wrecking the U.S. Open, NCAA, and American records in the 400 IM at NCAAs. She also wiped Elaine Breeden’s name out of the record books with a 1:49 200 fly at Pac-12s. 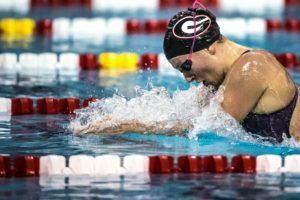 Nelson struggled her freshman year despite being an incredibly highly-touted recruit in high school, but nonetheless became just the fourth woman under 50 seconds in the 100 back this year, and hit best times in nearly every event. Seliskar is incredibly versatile and switched from the 200 fly to the 200 breast this season, which resulted in a lifetime best 1:50.42 runner-up performance at NCAAs. He also lit it up with a PR in the 200 free this year — 1:31.28. Eastin, Nelson, and Seliskar will be ones to watch at this meet and on through this summer as they’ll attempt to extend their success into the long course pool. Is he racing this weekend? While I expect masse to be faster at the end of the year, it wouldn’t surprise me if smith comes out on top here as there’s a big difference between being 16 and in your 20s. Either way, it’ll be interesting to see what they look like, not expecting fast times though. I’m guessing you’re a midwest guy? Besides the occasional personal bests, like potentially Oleksiak further lowering her PB in the 200m butterfly, I concur.